Store sesame seeds in a cool area, such as a refrigerator. 1 What Are the Benefits of Sesame Seed Oil? Sesame seeds complement breads, meats, vegetables and many other dishes. The seeds are eaten whole, used for their oil or ground into a paste. 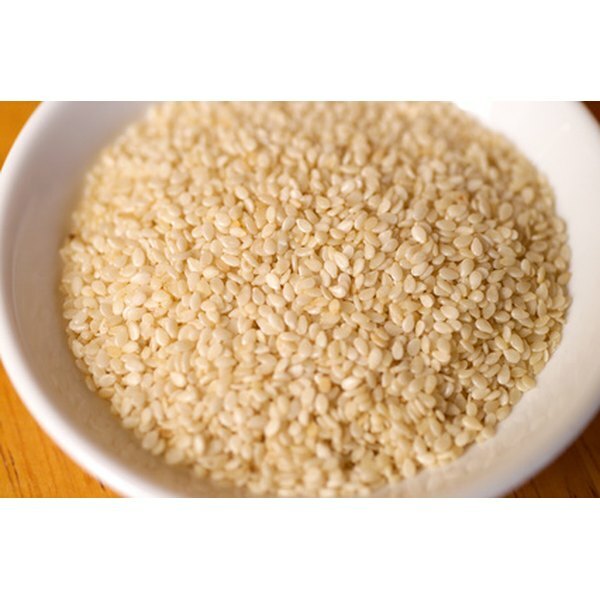 Like many foods, sesame seeds can go rancid if not stored properly. According to Chow.com, this is due to the seed’s high oil content. The seeds contain a natural preservative called sesamin which delays rancidity, but cannot prevent it indefinitely. Place sesame seeds (loose or in plastic bags) in an airtight container made of glass or plastic. Put the container in a cool, dark cupboard or in your refrigerator. The sesame seeds should stay good in the cupboard for three months. Refrigerated, the seeds should stay good up to six months. Place the sesame seeds in freezer bags and freeze them for long-term storage for up to one year. Double bag the sesame seeds to prevent them from acquiring food odors. According to Mollie Katzen, rancid sesame seeds develop a grey color.